Beautiful, clear, fresh water is what everyone desires for their home. Therefore, when our water has a smell, or is discolored, we begin to worry about its quality. Discolored water, or water with a smell, may be safe to drink, but is normally undesirable. Smelly water can be difficult to drink, and discolored water can leave stains on clothing, sinks, tubs, and toilets. For this reason, and concerns for safety, it is advised to figure out what is causing your home’s water to smell or be discolored. Green or a blueish tinted water could indicate that copper or lead is leaching into your water from the pipes. Many homes have copper pipes and when those pipes corrode they leach copper into the water. Those who have sensitive skin can develop itchy skin rashes from water with copper in it. Worse than copper is lead. Lead is hazardous to human health. Most homes and buildings built with lead pipes had them replaced. However, some homes still have sections of lead pipe, and some older homes still have pipes with joints that were soldered together with lead. Depending on the concentration, the problem may be able to be fixed by filtering the water. If that doesn’t work, a skilled plumber will need to find the problem pipes and replace them. Regardless, blue or green tinted water means you should call a plumber and have your water tested. If your water is tinted brown, yellow, or red it is most likely rust. Rust in your water doesn’t normally pose a health risk. If anything, it normally just adds extra iron to your water. However, while iron isn’t harmful, the brown tint from the rust stains clothes, appliances, dishes, and clothes. It also causes the water to have an undesirable metallic taste. The most efficient way to deal with rust in the water is to use a whole house water filter. If the problem is located to one specific faucet or area of the home, then you may only need a filter on that faucet. A skilled plumber can help you determine if the rust is coming from the pipes in your home, or the pipes delivering the water to your home. White or tan particles in the water usually means you have calcium or magnesium in the water, which means you have hard water. This mineral buildup can cause soap and detergents to perform poorly, causes buildup on fixtures and in appliances, creates a sour smell on clothing, and shortens the life of clothing, fabrics and appliances. Hard water isn’t hazardous to health, but it can be a nuisance and cause clogged pipes. While white or tan particles in water generally has an environmental source, it can also be caused by calcium and magnesium collecting on your electrical water heater. If your problem is hard water a water filter will solve the problem. If your water heater has started to develop a mineral buildup, then you will need to call a plumber to remove and clean the heating elements. Discolored water is normally harmless, but for peace of mind it is worth having your water tested. If you do have hard water it is also worth installing a water filter, as this will help increase the life of your appliances and make cleaning easier. Smelly water is usually a sign that there are bacteria in the water. This smell can occur with just the cold water, the hot water, or occur with both. Hot water smells: Sulfur smell from hydrogen sulfide in hot water is a common problem for homeowners who use well water. Removing the anode rod from your water heater tank could solve the problem, but that could also shorten the lifespan of the water heater because of corrosion. You could replace the rod with a more expensive aluminum of zinc rod, or install a dealkalizer system. Cold water smells: When your cold-water smells like rotten eggs first thing in the morning, or when you haven’t used it in a couple of hours, the source is most likely sulfate-reducing bacteria. The best remedy for this issue is a water filtration and treatment system. Hot and cold-water smell: If both the hot and cold-water smell like rotten eggs, then the source is probably a naturally occurring hydrogen sulfide. Hydrogen sulfide isn’t going to hurt you, but the smell can be nauseating. Again, the best solution will be water treatment and filtration.Believe it or not, but it is common for water smells and discoloration to originate from the water heater. If you do not use well water, this is the first place to start your investigation. 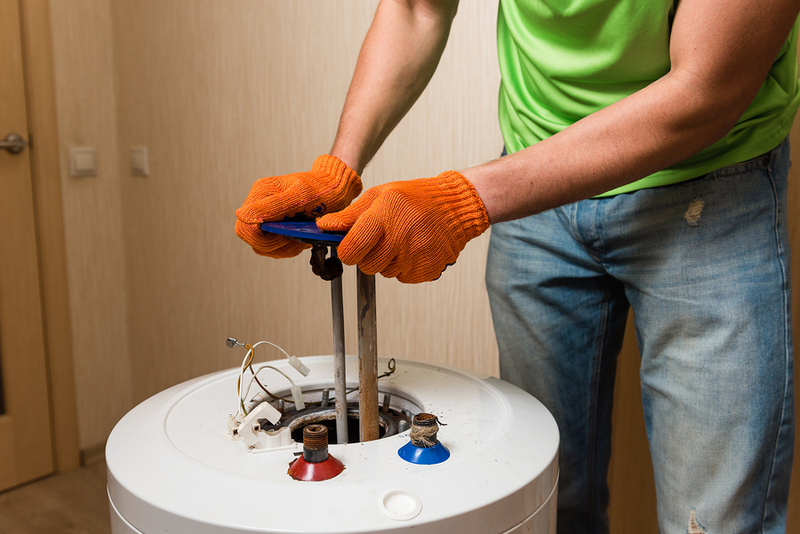 Having your water heater drained and flushed, and replacing the anode rod, can go a long way to resolving the problem. If you are ready to get your water tested and solve your water problems, give Emergency Plumbing and Solar a call today. We can expertly diagnose the problem and offer the right solution for your situation. Smelly or discolored water. Could it be your water heater? Overall rating: 5 out of 5 based on 10 reviews.